SAN DIEGO — San Diego Civic and Community Leaders joined bicycling advocates and environmentalists in a special event that showcased cycling as multimodal transportation option and a solution to climate change on December 2, in a ride from Little Italy to Balboa Park to kick off the annual December Nights celebration in Balboa Park. 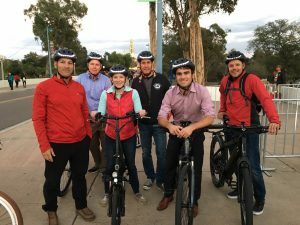 The event focused attention on alternative transportation options to December Nights, which draws over 350,000 people over two nights making it one of the most popular in San Diego County. The event’s lead sponsor is the Amgen Tour of California — San Diego. In addition to ordinary bicycles, officials and advocates transported on state-of-the-art pedal-assist electric bicycles outfitted with the latest in new rider visibility technology featuring Lumos Helmets, first bicycle helmet to feature integrated brake, lights and turn signals. The event is sponsored by Stromer electric bikes and supported by the Electric Bike Central, 2021 India Street. Attendees will include the Office of Congressman Juan Vargas, Office of Congressman Scott Peters, Climate Action Campaign, Office of Supervisor Ron Roberts, Barrel O Monkeyz social media team, Appetite4Adventure, Challenged Athletes Foundation, and e-Bike Advocate Turbo Bob Bandhauer, among others. The public is invited to ride in the event. The event showcased pedal assist e-Bikes and their unique ability to conquer our geography with little effort and no sweat providing a viable option for San Diego commuters, recreation cyclists and those interested in reducing car trips, traffic and congestion. Safety and visibility on the road remains a huge concern for bicyclists so attendees rode with the new LED integrated Lumos helmets, dramatically increasing their visibility to motorists during the day and night. Stromer and e-JOE Bike provided electric bikes for a tour into Balboa Park to enjoy the December Nights festival. The city’s ambitious climate action plan requires the number of people bicycling to work or school in the city’s densely populated neighborhoods to increase from about 2 percent to 6 percent by 2020, and then to 18 percent by 2035.